This convertible two bedroom 2.5 bath home has charming treetop views from every room directly overlooking Central Park. Sunlight floods every room of the apartment through new oversized casement windows. A graciously proportioned living room has custom built-in cabinetry and handsome decorative fireplace. A formal dining area with beamed ceiling is located off of the kitchen and living room. The modern stainless steel kitchen has appliances by Viking, Subzero and Bosch. A cozy wood-paneled home office/guest room is located off the dining and living rooms. The large master bedroom boasts two full ensuite baths with a huge shared walk-in shower and plenty of custom built-ins and closets. Off the entrance hall are storage closets, a powder room as well as Miele washer/dryer. Hardwood and herringbone floors throughout. 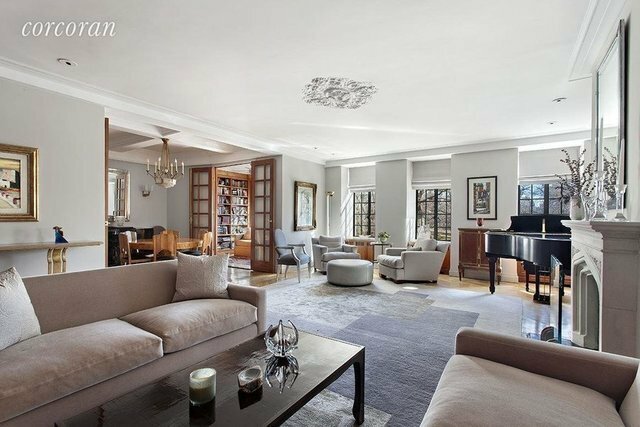 This approximately 1,557sf home is tastefully renovated with many custom details and is a Central Park West gem. This legendary 1931 Emory Roth Art Deco landmark, The El Dorado offers the finest white-glove services and amenities including full-time doormen, concierge, on-site super and management, community room, newly renovated gym, half basketball court, bike room, central laundry room, garage (waiting list) and beautifully restored lobby. Pied-a-terre and international buyers allowed. Pets are welcome. Maintenance includes cable. There is a monthly assessment of $105.61 which will end in 2028.